There are lots of servo motors available in the market and each one has its own speciality and applications. The following two paragraphs will help you identify the right type of servo motor for your project/system. 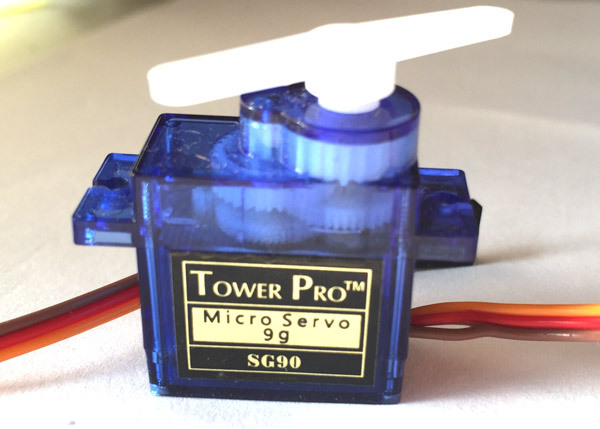 Most of the hobby Servo motors operates from 4.8V to 6.5V, the higher the voltage higher the torque we can achieve, but most commonly they are operated at +5V. Almost all hobby servo motors can rotate only from 0° to 180° due to their gear arrangement so make sure you project can live with the half circle if no, you can prefer for a 0° to 360° motor or modify the motor to make a full circle. The gears in the motors are easily subjected to wear and tear, so if your application requires stronger and long running motors you can go with metal gears or just stick with normal plastic gear. Next comes the most important parameter, which is the torque at which the motor operates. Again there are many choices here but the commonly available one is the 2.5kg/cm torque which comes with the Towerpro SG90 Motor. This 2.5kg/cm torque means that the motor can pull a weight of 2.5kg when it is suspended at a distance of 1cm. So if you suspend the load at 0.5cm then the motor can pull a load of 5kg similarly if you suspend the load at 2cm then can pull only 1.25. Based on the load which you use in the project you can select the motor with proper torque. The below picture will illustrate the same. 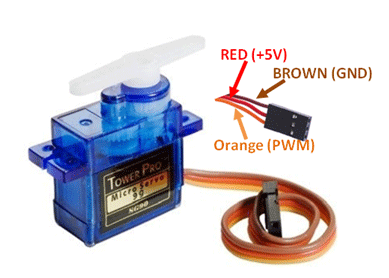 After selecting the right Servo motor for the project, comes the question how to use it. As we know there are three wires coming out of this motor. The description of the same is given on top of this page. To make this motor rotate, we have to power the motor with +5V using the Red and Brown wire and send PWM signals to the Orange colour wire. Hence we need something that could generate PWM signals to make this motor work, this something could be anything like a 555 Timer or other Microcontroller platforms like Arduino, PIC, ARM or even a microprocessor like Raspberry Pie. Now, how to control the direction of the motor? To understand that let us a look at the picture given in the datasheet.